"I've had this camp circled on my calendar since end of last tournament. It's something I've been working towards the entire year, so I'm really excited and confident that all the work I've put in up to this point will pay off. It's just about playing, having fun and trusting all the work I've done." "It was good to see him back on the ice. He was a good player last year and I think he's progressed well. You see his maturity in his game physically, he's hard on battles, he's retrieving a lot of pucks, winning one-on-ones. It's good to see him back." ►This week’s episode of Hockey On Campus features interviews with Bentley Coach Ryan Soderquist, UMass defenseman Cale Makar and former Terrier assistant coach and Northeastern Head Coach Ben Smith, who was inducted into the U.S. Hockey Hall of Fame on Wednesday night, along with Jack Parker and Scott Young. Hockey on Campus airs on NHL Radio (SiriusXMChannel 91) on Saturday morning at 8 a.m. ET and Sunday morning at 10 a.m. ET. You can also find it here on College Hockey News. 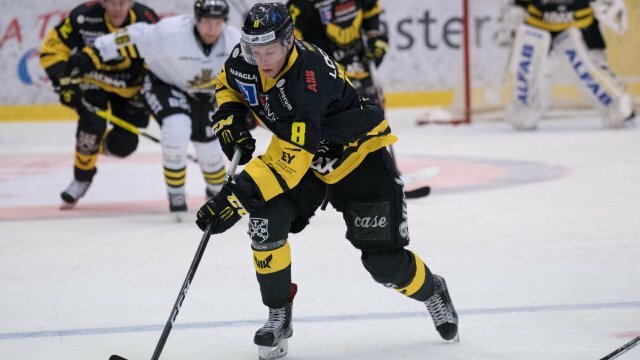 2018 recruit Hugo Blixt scored his fourth goal of the season in Tri-City’s 4-2 loss to Dubuque. The 6'3" Swedish blueliner had announced his commitment to BU earlier in the week. 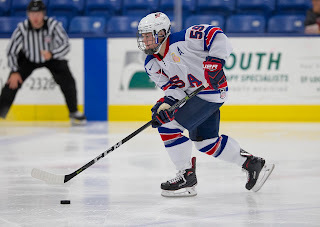 2019 recruit Trevor Zegras (photo) scored a goal and fellow 2019 recruits defensemen Alex Vlasic and Case McCarthy each contributed an assist as Team USA defeated Switzerland, 7-2, in the Four Nations Tournament in Veliky Novgorod, Russia. Team USA plays the host Russian team on Saturday. Jack Eichel had a hand in all four Buffalo goals—with his first-career hat trick and an assist in the Sabres’ 5-4 overtime loss to Carolina. TheHockeyWriters.com suggest reuniting Terrier linemates Eichel and Evan Rodrigues would help rev up Buffalo’s offense. Since his recall from Rochester, Rodrigues has two goals and an assist in five games. Alex Chiasson scored a pair of goals, including the game-winner on a shorthanded breakaway, as Washington defeated the Bruins, 5-3. 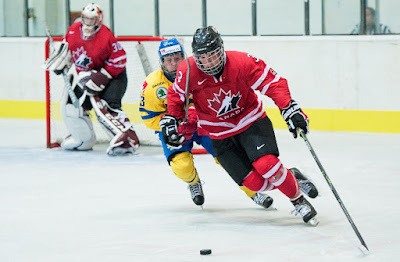 Former Terrier captain Marie-Philip Poulin scored for Team Canada in a 3-1 win over Team USA in a pre-Olympic match-up between the two national teams. Former Terrier standout Jen Wakefield also is on Canada’s roster.